Henry II was the first of the Plantagenet line of English Kings. 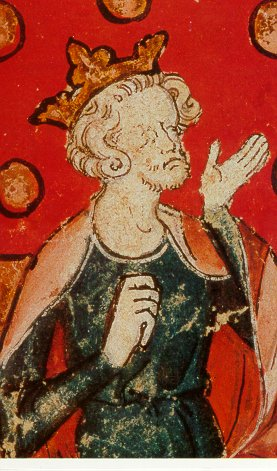 Henry was the eldest son of Geoffrey, Earl of Anjou, and his wife, the ex-Empress Matilda, daughter of Henry I, and was born at Mans, in March, 1133. He received his education in England, under the care of his uncle Robert, Earl of Gloucester. On the death of his fathemr, in 1151, he succeeded to the earldom of Anjou, Touraine, and Maine, and in the following year, by his marriage with Eleanor of Aquitaine, the divorced wife of Louis VII. of France, he became possessor of the duchy of Aquitaine or Guienne. The same year he invaded England, but a treaty was concluded, in 1153, by which it was agreed that he should succeed to the throne of England on the death of Stephen. This event took place in October, 1154, and Henry was crowned without opposition at Westminster, in December. His first measures were directed to the redress of the disorders and anarchy which had prevailed in the reign of Stephen. He seized and destroyed most of the baronial castles; dismissed the foreign troops; renewed the charter granted by Henry I; and resumed most of the lands which had been alienated from the crown by Stephen. On the death of his brother Geoffrey he claimed and got possession of Nantes, and was thus master of the whole western coast of France. His attempt on Toulouse, in 1159, involved him in a war with the King of France, which was only terminated two years later. In 1162 Thomas a Becket was elected Archbishop of Canterbury, and the great struggle between the civil and ecclesiastical powers began, which resulted in the Constitutions of Clarendon, the exile and murder of Becket, war with France, the king’s penance at Becket’s tomb, and the repeal of the Constitutions. In 1171 Henry invaded Ireland, and, under the authority of a bull of Pope Adrian IV., which had been published in 1156, effected a conquest of that island. The remaining years of his reign were embittered by the numerous revolts of his sons, instigated by their mother. Eleanor, whose jealousy was excited by the king’s affection for Fair Rosamond, attempted to follow her sons to the court of France, but was seized and imprisoned during Henry’s life. The King of Scotland, who supported the rebellion of the young princes, was taken prisoner at Alnwick, in 1174, but was released after a few months, on doing homage to Henry. A formal reconciliation with the princes took place, but was followed by a fresh revolt and civil war. Prince Henry, who, as heir-apparent, had been crowned in 1170, died in France, in 1183. Geoffrey was killed at a tournament, two years later; and John joined his brother Richard in a new rebellion against their father, in which they were aided by Philip Augustus. The old king was prostrated by sickness, and the revolt of his youngest son John was the last and fatal blow from which he could not recover. He died at Chinon, July 6, 1189, and was buried at Foutevraud. Notwithstanding the conflicting estimates of the character and measures of Henry II, viewed as the champion of state supremacy, it is evident that he was a man of powerful intellect superior education, great energy, activity, and decisiveness, and also of impetuous passions. Ruling almost despotically, he greatly diminished the power of the nobles, and thus relieved the people of their intolerable tyranny. Good order and just administration of the laws were established and the practice of holding the assizes was introduced. He revived the trial by jury in order to check the resort to trial by battle which he could not abolish.